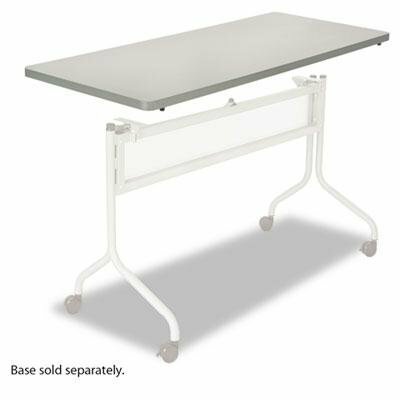 Safco - Impromptu Series Mobile Training Table Top Rectangular 48W X 24D Gray "Product Category: Office Furniture/Meeting/Training Room Tables"
Impromptu Series Mobile Training Table Top Rectangular 48w x 24d Gray - Ideal for training rooms conference rooms mail rooms or media centers. - 1" thick high-pressure laminate with durable vinyl edge band. - Top and Base sold and shipped separately—ORDER BOTH. - Top Color: Gray Top Shape: Rectangular Top Thickness: 1" Overall Width: 48". Hon - Huddle Multipurpose Rectangular Top 60W X 24D Silver Mesh/Black "Product Category: Office Furniture/Meeting/Training Room Tables"
Safco - Impromptu Series Mobile Training Table Top Rectangular 48W X 24D Cherry "Product Category: Office Furniture/Meeting/Training Room Tables"
Hon - Huddle Multipurpose Rectangular Top 60W X 24D Harvest/Black "Product Category: Office Furniture/Meeting/Training Room Tables"
Safco - Cha-Cha Table Top Laminate Round 36" Diameter Gray "Product Category: Office Furniture/Meeting/Training Room Tables"
Alera - Valencia Series Training Table Top Rectangular 71W X 23-5/8D Speckled Gray "Product Category: Office Furniture/Meeting/Training Room Tables"
Safco - Impromptu Series T-Leg Table Base Steel 28-1/2W X 28-1/2H Black "Product Category: Office Furniture/Meeting/Training Room Tables"
Alera - Valencia Series Training Table Top Trapezoid 47-1/4W X 23-5/8D Mahogany "Product Category: Office Furniture/Meeting/Training Room Tables"
Alera - Valencia Series Training Table Top Trapezoid 47-1/4W X 23-5/8D Medium Cherry "Product Category: Office Furniture/Meeting/Training Room Tables"
Safco - Cha-Cha Table Top Laminate Round 30" Diameter Gray "Product Category: Office Furniture/Meeting/Training Room Tables"
Balt - Iflex Series Full Table 65W X 31D X 29H Cherry/Silver "Product Category: Office Furniture/Meeting/Training Room Tables"